When I first moved to the West Coast I worked at a dealership that sold popular European motorcycles as well as electric bikes—this was my first exposure to them. I then saw these bikes burning rubber while I worked as an AFM (amateur road racing club) turn worker. Right around that time, electric motorcycles were hitting the racetrack both at the amateur and pro level. It's clear electric bikes have potential—after all, they're racing with 600cc gas-powered motorcycles. But even witnessing this, I wasn't dying to ride one...but I was curious nonetheless. Fortunately, I was able to ride one sooner rather than later... and let's just say I wasn't expecting what it had to offer. California-based Zero Motorcycles made impressive headlines recently. In 2014, the company finished with record sales and is planning to break the previous year's record in 2015. More about the new Zero Motorcycles can be read here. We checked out Zero's SR ZF12.5 model, which is considered the sportier version of their street bike, the S model. Let's get right into what makes this a fun moto to ride. For this ride we had a group of two guys and me, a gal. We started in the parking lot at Zero's headquarters where we met the bikes. The SR appeared to be at a good height for all—not too tall and not too short. We were then quickly given a rundown on how to operate it since it's a bit different from the norm. The only way to know it was on was by looking down at the dash. We needed to make sure the small red light was no longer lit, and that it was green. Once green, it signified that the throttle is live, so we had to be mindful to not accidentally roll it on. Zero is located in Scotts Valley, California, which is right on the outskirts of the Santa Cruz. We were taken through the local twisty roads backroads. The ride wasn't too long, maybe about 20 miles, but it was enough to get a good feel for the SR. The very first thing that pops into mind when you get an electric bike going is that it's quiet. The motor isn't dead silent, but it can be unnerving since most people who ride motos are use to a sound—any sound—that let's you know how much your revving the thing. The SR has one continuous rev it seems...it's quite hard to explain in writing so check out our test ride video below. The SR has Zero's own Z-Force® motor that the company says, "produces up to 130% more power and 150% more torque. Even more impressive, the compact brushless motor requires no liquid or forced-air cooling." The motor also doesn't require any regular maintenance because it's sealed away and protected from high temps—all the heat emits away from the motor due to the aluminum cooling fins (see picture below). Compared to the Zero S ZF12.5 motor, the SR ZF12.5 features a larger 660 amp motor controller that provides 25 percent more power (67 hp) and 56 percent more torque (106 ft-lb). This translates to the SR being able to go from 0-60 in under four seconds and has a top speed just a little over 100 mph. On the dash interface, there are three modes to choose from: Custom, Eco, and Sport. The Custom mode is exactly what the name implies. An app can be downloaded for the Android and iPhone, and from there the rider can customize preferable top speed, acceleration, and regenerative braking. The Eco (short for economy) mode cuts back the power and torque the SR produces. It's a great mode to put on in order to get a longer range and to do easy riding on busy streets. Finally, the Sport mode allows the rider to utilize the full 67 horsepower and 106 lb-ft torque. It was suggested to us that we start out in the "Eco" mode and then kick it into "Sport" mode once we went a few miles and were at a stop to feel the differences. In Eco mode, taking off was incredibly smooth and the throttle was quite responsive. The SR is also comfortable, with the foot pegs positioned just right—not too far back, not too low, and not too far forward. So far, we were off to a great start. Look at the excitement on my face! One thing that took a bit of getting used to in the first couple of miles was the immediate instinct to shift, which isn't required with any Zero bike—a rider simply twists the throttle and goes. The need to shift quickly went away as the ride went on, and it made the SR (and any Zero bike really) one easy to maneuver. As instructed, after riding on a few miles on the local roads, the sport mode was kicked on at a stop sign (Note: make sure the throttle is completely closed before switching modes.) The power that surges back is immediately felt when taking off. The bike was more responsive and quicker, and like the start of the ride, just as smooth. Once feeling the SR in Sport mode, hitting the Santa Cruz Mountain roads was even more thrilling. Even though the bike glided along these roads nicely and pulled well with all of its 106 lb-t torque, it didn't feel overwhelmingly powerful. It can probably be compared to the power of a 600cc sportbike. Also new for this year—all Zero motorcycles come with a Bosch anti-lock braking system (ABS) that can be turned off if a rider decides to go off road with it. The overall braking on the SR felt authoritative, and fortunately the ABS wasn't tested during our excursion. The good news is that if it had to be, we had the reassurance that the wheels wouldn't lock up while riding. All Zero models come equipped with Showa suspension (also new for this year). Showa suspension can also be found stock on sportbikes, and is overall considered a good quality suspension. As a lightweight rider, however, the suspension can often can be way too stiff and difficult to soften without changing a few parts out. This is probably because a stock sportbike suspension is dialed in for a 180 pound person. However, the SR's suspension was close to a perfect (at least better than a sportbike) set up for the road. It was very compliant and turned with hardly any effort. It was easy to feel how it handled when carrying a bit more speed through the corners. There were both smooth and rough patches of road, and the suspension was able to maintain beautifully, especially through those harsher portions. The Zero SR comes in starting at $17,345. You can add options like the Power Tank, which gives you a longer range (about 185 city miles) before needing to put it on charge. This will cost an additional $2,495.00. There's also the Quick-charge available for an extra 599.99. So that gets you closer to 25K price tag, which is a pretty penny for bike that isn't a Ducati or its equivalent. You could potentially go with the S model, which is only $13,345.00 at its basic trim. It has the same additional options as the SR, and also has a ZF12.5 option for an additional 2K that provides longer range than the base ZF9.4 version (113 vs. 151 city miles), but it doesn't produce as much torque or horsepower as the SR ZF12.5. Adding all the extras brings the price to around 19K. The Zero SR truly had some pep to it's step—it's a fun to ride, comfortable, smooth, electric sport motorcycle. Men's Journal says it best by saying it's "more Porsche than Prius." This is certainly true. 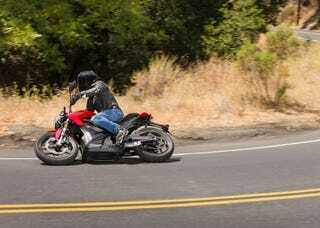 The SR produces more than enough power to have fun through twisty roads all while taking little effort to operate. However, there are some drawbacks. The most common question that comes up with an electric bike is the range. As previously mentioned, by purchasing an optional power pack, the SR model can get a range of up to 185 city miles before it needs a charge. The charge can also be long without any sort of quick charger—it's around eight or so hours, and with one, it cuts that time in half. Ultimately though, the range a rider can get out of a Zero depends on how the bike is ridden. So with the bike stock, expect anywhere from 100-150 before putting it on a charge. Also, the price can be pretty steep, but Zero counters this argument by stating that the cost savings come from not having to gas up or routinely maintenance the bike. In the end, it depends on what you're looking for in a motorcycle: a commuter to get you around town or a bike you get comfy with and enjoy traveling long distances together. If it's the latter (which is what I pick), stick to the old-fashioned gas powered motorcycle. Eventually though, electric will probably keep gaining popularity and the reasons to get a battery powered motorcycle will make more sense. This post was written by Laura Llovet.